Donald Keene ’42, ’49 GSAS arrived on Morningside by subway as a shy 16-year-old from Brooklyn. He leaves the Columbia faculty 73 years later as a globally renowned scholar and translator of Japanese literature, and a beloved figure in Japan, where he has now chosen to live as a citizen. In the wake of the Tohoku earthquake, tsunami and nuclear disaster last March, it came to light that the emi­nent Columbia University professor Donald Keene ’42, ’49 GSAS had chosen to retire to Japan. His decision became a ma­jor news story there, cheering a nation that appreciated the gesture of solidarity from a re­vered sensei — teacher — at a time when many foreigners were leaving Japan. I thought about how I was going to live the restof my life, and I decided it would have to be in Japan. A modest, soft-spoken scholar and teacher, the 89-year-old Keene is virtually unknown to the broad American public. In the realm of Japanese letters, however, his reputation could hardly be more stellar. As a teacher, essayist, literary and cul­tural historian, critic, anthologist, memoirist, editor and transla­tor — with some 25 books in English and another 30 in Japanese — he is perhaps the quintessential figure in his field. Keene certainly has not lacked for recognition on the west­ern side of the Pacific. 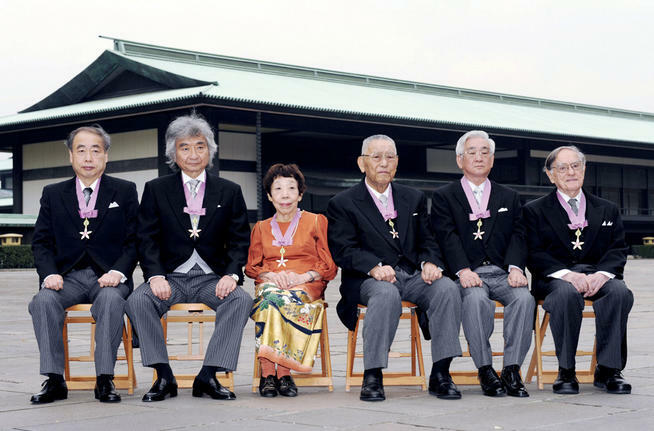 He has received a number of Japan’s most distinguished prizes, most recently the Order of Cul­ture (Bunka-Kunsho), which the Japanese government awards for significant contributions to the nation’s culture; he was the first foreign national to be so honored. Fred Katayama ’82, ’83J is a news anchor for Thomson Reuters television in New York and a former student and longtime friend of Keene’s. Katayama remembers switching on NHK — the BBC of Japan — and watching in awe as his teacher interviewed then-Prime Minister Yasuhiro Nakasone one-on-one. 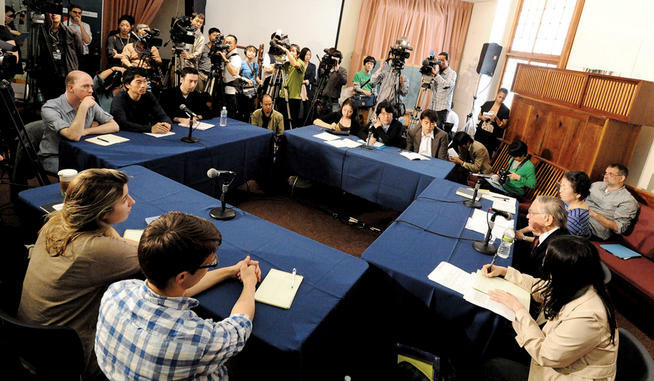 Keene so en­gages the Japanese public, Katayama observes, that his memoirs were serialized in Yomiuri Shimbun, the nation’s (and the world’s) leading daily newspaper, with a paid circulation of more than 14 million. “I think they feel that he knows and understands Japan more than perhaps any foreigner,” Ka­tayama says. A third-generation Japanese-Ameri­can from Los Angeles, Katayama spent a number of years in Tokyo as a cor­respondent for Fortune, the Associated Press and the program Japan Business Today, seen on CNBC in the United States; he sits on the board of the Japan Society and the U.S.-Japan Council, in Washington, D.C. Yet it was Keene who inspired him to embrace his own cul­tural ancestry. Born in 1922, Keene speaks with some sadness of his boyhood in Brooklyn’s Flatbush section. In 1934, he lost his sister, which left him an only child. Keene’s father, who sold radio parts and later real estate, left his mother “under very unpleasant condi­tions” when he was 15, Keene says. “And then he disappeared from my life altogether for a period. I didn’t even know where he was.” Keene himself has never married. Lonely and, by his own reckoning, exceptionally unathletic, Keene found solace in stamp collecting, which opened his eyes to a wider world of nations and languages, and in movies, which opened his eyes even wider. Years later, as a professor, Keene es­corted Greta Garbo, a friend of a friend, to the Broadway produc­tion of The Diary of Anne Frank. “After emerging from the theater, we waited briefly for a taxi, and the drivers of passing cars halted their vehicles for a better look at the famous face,” he later recalled. 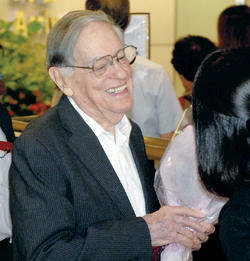 Keene accepts flowers upon arriving in Japan on September 1. PHOTO: THE YOMIURI SHIMBUN VIA AP IMAGESIn 1938, Keene attended his first performance of the Metro­politan Opera; it was Orfeo ed Euridice. The following year, as a birthday gift, his mother gave him a subscription to 16 successive Friday nights at the Met. The teenaged Keene sat in the last row of the uppermost tier, where tickets cost $1, and was hooked for life. One of Keene’s chief regrets in leaving New York is giving up his Met Opera subscription. It was also in 1938 that he graduated from James Madison High School, a Brooklyn public school that also has produced four Nobel laureates, three U.S. senators and a Supreme Court justice — Ruth Bader Ginsburg ’59L (not to mention Judge Judy, songwriter Car­ole King and comedian Chris Rock). Thanks to a Pulitzer scholar­ship, Keene was able to attend Columbia. His closest acquaintance was a Chinese student named Lee who happened to have been seated behind him in Van Doren’s class. The following summer, in 1939, they took to swimming together at the Riis Park beach in Rockaway, Queens. Lee taught Keene some Chinese characters, which he practiced drawing in the sand. It was his introduc­tion to Asian languages. For the next two years, they ate lunch together every day at the New Asia restaurant at Broadway and West 111th Street, which became Moon Palace. One day in fall 1940, Keene was browsing the remainder shelves at a Times Square bookseller when he spot­ted a two-volume edition of the classic work The Tale of Genji, selling for just 49 cents. He bought it and was so enchant­ed by the story, and by Arthur Waley’s elegant translation, that he yearned to read it in the original Japanese. Chance continued to play a part in Keene’s turn to the Orient, as it was then commonly called. In spring 1941, a stranger ap­proached him in the East Asian Library, housed in what is now the Faculty Room in Low Library. He introduced himself as Jack Kerr, and mentioned seeing Keene often at the Chinese restau­rant. Kerr was forming a small group to study Japanese that sum­mer at his house in the North Carolina mountains, and wondered if Keene might care to join them. Keene accepted. It was Kerr — who went on to teach Japanese history at other universities — who recommended that Keene register for Tsunoda’s class for the Fall 1941 term. On December 7, 1941, Keene went hiking on Staten Island. When he returned to lower Manhattan, he saw the news: The Japanese had attacked Pearl Harbor. Tsunoda was detained the next day as an enemy alien. He was accused of espionage, but a judge dismissed the charges a few weeks later and Tsunoda re­turned to teaching. Keene graduated the following spring, wondering what the war would bring. He had been a pacifist since childhood; he re­members how he felt visiting a Vienna museum with his father in 1931 and looking at the automobile in which the Austrian Arch­duke Franz Ferdinand and his wife had been assassinated in Sarajevo in 1914, touching off WWI. The sight of the archduke’s blood-stained uniform and the white plume in his ceremonial helmet “crystallized my hatred of bloodshed,” Keene wrote in his Chronicles. So when he learned that the U.S. Navy needed in­telligence officers and was training Americans to speak Japanese as well as shoot guns at them, he signed up. When they finished their training in 1943, both men were assigned to the headquarters of Adm. Chester W. Nim­itz, commander in chief of the U.S. Pa­cific fleet, at Pearl Harbor. They rented a house in Honolulu to serve as home base while they were sent out on dif­ferent missions, in different campaigns. Keene and de Bary crossed paths in the Aleutians and at Okinawa in 1945, and they remained in touch as their tours wound down after the war. (Their correspondence later was published in War-Wasted Asia: Letters, 1945–46, edited by the late historian Otis Cary, who served with Keene in the Pacific.) De Bary’s postwar plan was to continue graduate work at Harvard, but Keene had a better idea. “Donald persuaded me not to return to Harvard,” de Bary says, “but to come back and join him and study with Ryusaku Tsunoda.” As a scholar, teacher, academic statesman and defender of principle, de Bary has become one of the most significant figures in the his­tory of the University; now 91, he has taught at Columbia in eight different decades. During his service in the Pacific theater, Keene acted as an interpreter, translated documents and conducted prisoner inter­rogations. He was moved by some of the diaries of captured or killed soldiers he encountered, and felt empathy for some of the POWs he questioned. There’s a Japanese sensibility to him — modest, quiet, extremely diligent, but neverpatronizing orcondescending. Keene returned to Columbia after the war to study with Tsunoda, earning an M.A. in 1947 and a Ph.D. in East Asian Languages and cultures in 1949 (sandwiched around a year of graduate study at Harvard). He then earned a second master’s at Cambridge University in England, where he lectured from 1949–55. On Keene’s first night at Corpus Christi College — in the “coldest rooms in Cambridge,” he was told — a porter brought him a dinner of whitefish with a white sauce and white potatoes and white cabbage on a white plate. “I had never realized before how important color is to food,” he later wrote. Those gifts earned Keene increasing renown in the years that followed. While teaching at Columbia in the 1950s and ’60s, he spent summers in Japan coming to know many of the country’s leading literary and cultural figures — among them Yukio Mishi­ma, Kanzaburo Oe and Kobo Abe — while deepening his own knowledge and appreciation of their world. The subtle virtues of Japanese culture — and the challenges of translating and communicating its beauty — continue to animate Keene. Having witnessed Japan’s rebirth after the catastrophes of WWII, Keene has faith that his adopted country will heal from this year’s natural disasters. “In 1955 I took a journey to the northern parts of Japan, which was the same one that had been taken in 1689 by the great Japa­nese poet Basho,” Keene says. The haiku master was particularly inspired by Matsushima Bay, with its hundreds of tiny, pine-clad islands. After the Tohoku earthquake of March 11, a monster tsunami wreaked destruction along that coast, killing thousands. When Keene heard the news, his first concern was for the well-being of his many Japanese friends. But his thoughts also turned to Mat­sushima’s delicate islands. Former CCT editor Jamie Katz ’72 has held senior editorial positions at People and Vibe magazines and now writes for Smithsonian Maga­zine, among other publications.